Technology Market Research firm, The Radicati Group, predicts that by 2018, 80% of email users will access their email accounts via a mobile device. That sounds about right. Walk down any city street and practically everyone is glued to a smart phone. In New York, people walk out into traffic while on their phones. I’m not saying that’s an ideal scenario but I witness it daily. The upshot? 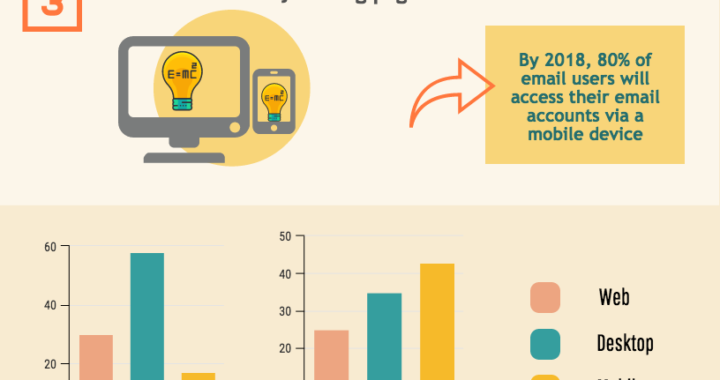 Mobile email opens will surpass that of desktop and webmail. As a result, responsive design can’t be an afterthought. Right now, Email opens on mobile devices have risen from 27% in 2011 to over 50% in 2016 That’s a significant percentage and smart marketers are busy devising strategies that will capitalize on a mobile movement that is dependent on email. People search mobile devices for the most relevant information they can find. It doesn’t matter who delivers the message; if it’s the right message, it’s a win. This demands marketers become adept at delivering relevant content to a specific audience at the right time. Responsive design is a part of that conversation. 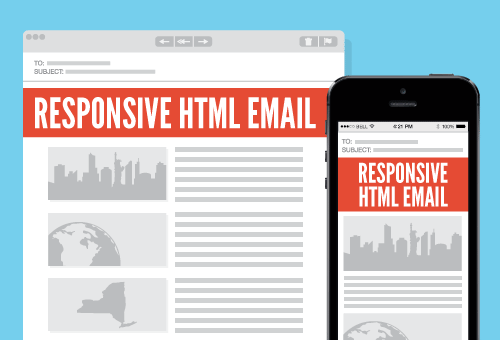 Once you know who your audience is and what they want, you can refine the message for responsive email. According to the 2017 State of Email Report by Litmus, it’s essential to create mobile-friendly emails along with mobile-friendly landing pages. How to do that? Personalize the mobile experience. “Mobile-friendly” assumes a level of personalization that consumers have come to expect. Along with this, streamlined design and targeted messaging are non-negotiable, particularly with Goggle’s move late last year to put mobile-indexing ahead of web. Also, late last year, iOS 10 began to include list-unsubscribe at the very top of every email. This makes it a snap for subscribers to opt out of your newsletter. That’s even more reason for content to be appealing and focused. You’ve got lots of room on a desktop to wax poetic but real estate on smart phones is demonstrably smaller. 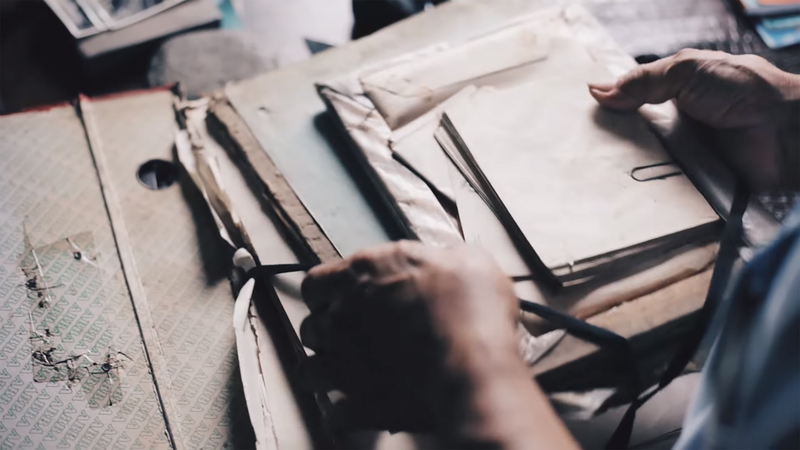 Distill your content to include the most relevant points. Make sure key benefits are visible in the first few lines of your message. The preheader is the short summary text directly after the subject line of an email. 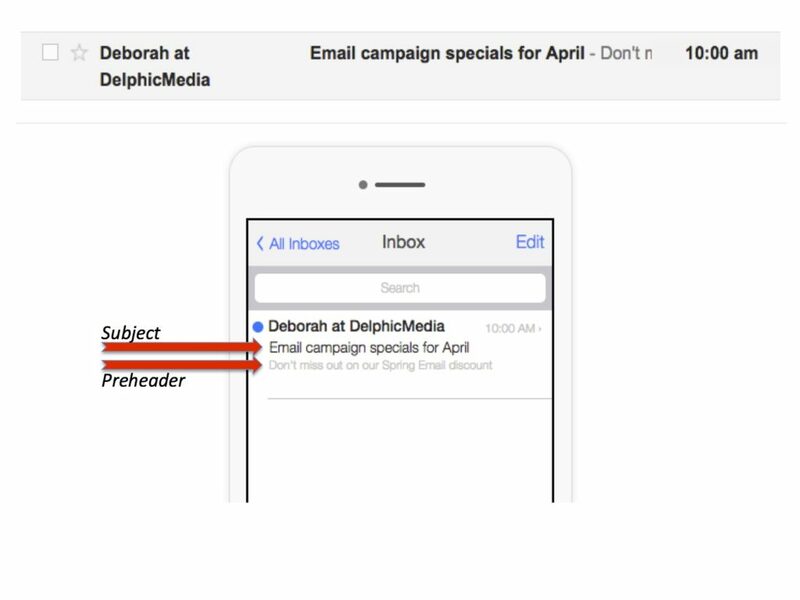 It’s automatically pulled from the first 75-100 characters of your email copy and displayed underneath the sender name and subject line in a subscriber’s inbox. In desktop email clients this would be called the “preview pane”. To avoid the automatic display of administrative content such as, “Having trouble viewing this email?” make the first lines of copy about the message. A separate page for mobile users is mandatory. Consumers using mobile are accessing what they need, or want, while on the run. Plus, they are probably multi-tasking so your email is competing with tons of distractions. Every element has to deliver. If you want conversions on mobile, you need landing pages created for mobile users. Use one column to avoid stacking on smaller devices. Single-column layouts should be no wider than 500 to 600 pixels. Links and buttons need to be at minimum, 44 × 44 pixels. White type on black is evil – never, ever do it. Stick to fonts that will render across most devices like Helvetica, Arial, Trebuchet MS, or Verdana. Also, make sure your CTA [Call to Action] is big and has enough white space around it so that it’s easy to click. According to market research company, Latitude, 63% of people plan on doing more shopping on their mobile device. 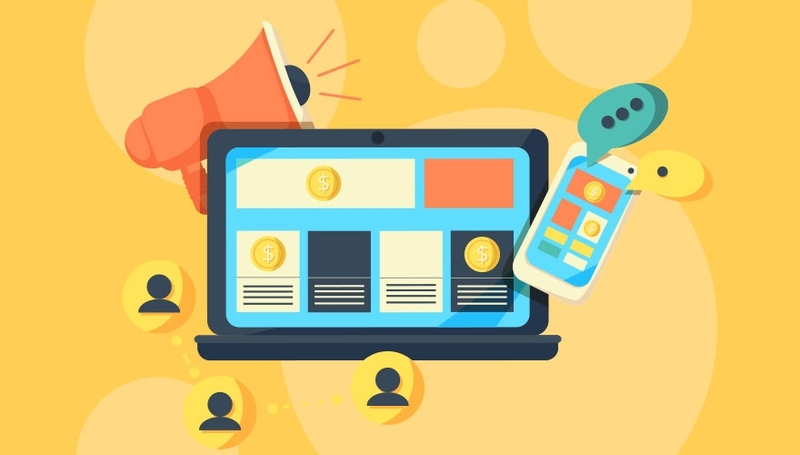 The problem is that an average of 69.23% mobile shoppers will abandon a transaction if the experience is not optimized, according to web usability research institute, Baymard. I know that’s true because I’ve abandoned lots of mobile shopping carts for being too clunky. It’s safe to assume that adapting a “mobile-first” email strategy is going to top the list of marketer’s “must-do”. Once Goggle’s “mobile-first” index is fully implemented there will be no more choice. It means Google will consider mobile versions of web pages as the primary page to index, leaving desktop versions in second place. Will you be ready? I’m guilty of email glut. By that I mean I just don’t open all my emails in a timely manner. I let them flounder in any one of several inboxes. My intentions are honorable. I sign up for everything that interests me and look forward to boundless missives of revelation, information, calls to action, free offers with restrictions, and promises that never truly materialize. I don’t mean to infer that a bulk of email is not valuable – a lot of it is. But alas, a lot of it isn’t. Of course, I answer client email immediately but I have the luxury of waiting to respond to everything else. Most people do the same thing. They have multiple email boxes to help weed out the wheat from the chaff – so to speak. So what makes me more likely to respond to an email when it isn’t essential? Evidently, it comes down to a few simple words. Productivity software provider, Boomerang, conducted a survey earlier this year and discovered something interesting. The right closing line in an email could compel subscribers to respond. Of course, it’s not just the closing line that determines response rate. Marketers know they’re competing for attention in very cluttered inboxes so emails have to be focused and targeted to the right community. Every word counts. That’s why the final words are so important. It’s just like your mother always told you. 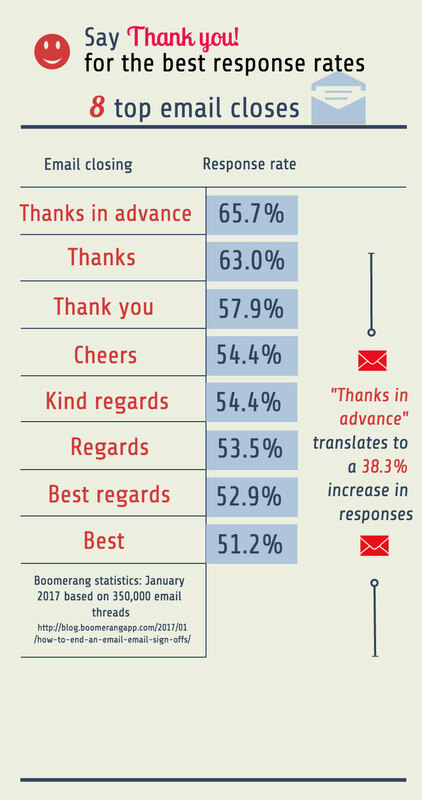 Remember to say “Please” and especially, “Thank you”.